Shadow Warrior! Now there’s a real blast from the past for any experienced PC gamer. Originally released in 1997 by 3D Realms, this was a first-person shooter with a distinctly ‘mysterious world of the orient’ theme going on – and a heavy helping of self-aware humor thrown into the mix. Well, over a decade has passed since its original release, and the team at Flying Wild Hog has decided to give the game a reboot. The result? An explosion-and-gore-filled adrenaline rush, decked out with great graphics, fun weapons, and extremely well-detailed enemies and environments, all with a brand of barbed-wit comedy that hits far more than it misses. 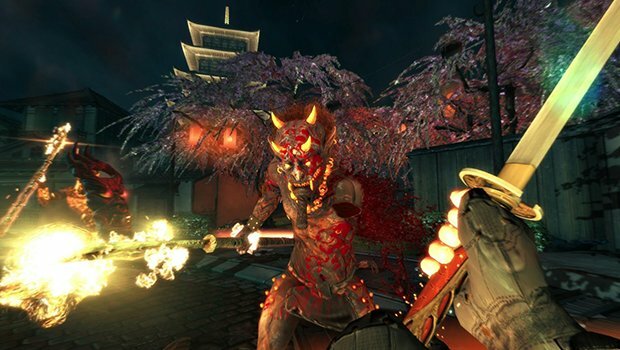 If you like subjecting hordes of demons to katana beheadings, uzi-sprayings, shotgun blasts and more – in an environment where just about everything explodes brilliantly if you so much as sneeze on it – then hit Steam and check out Shadow Warrior ASAP. One reason the chapter system works is the level design. While some of the usual downsides of this kind of heavily structured gameplay experience show up – invisible walls, far-too-convenient barricades, and bamboo barriers that my sword seems suspiciously incapable of slicing through – Shadow Warrior makes up for it all with absolutely gorgeous, detailed, if typically very dark and moody environments. You’ll navigate your way through asian-styled urban locales and graveyards, to industrial zones and factory interiors, and eventually even the shadow realm home of the various demons you’ll be encountering. Said demons are also gorgeously designed, every one of them created with impressive detail – made even more impressive by the various ways you can slice them apart or blast them to ribbons with your arsenal of terrifyingly designed pistol, uzi, shotgun and more. There are also secrets to find in each level, some of which are pretty clear throwbacks to the original Shadow Warrior title – complete with hidden areas that suddenly transition from the gloriously detailed modern world of gaming to the blocky, pixelated environment of ages long past. The game has a good sense of humor too. Comedy is not an easy thing to pull off, but a good share of the lines in Shadow Warrior had me grinning. Sometimes it was a quip from Lo Wang’s demon assistant. Other times it was just Lo Wang trying for a witty line in the middle of combat. The writing benefits from the characters themselves hardly seeming to take their own predicament too seriously at times – and considering the explosive nature of the Shadow Warrior world, it’s easy to see why. I mean explosive literally – everything from air conditioners to video game kiosks and more are prone to explode if you so much as chuck a shuriken or two at them, to the point where it seems as if nitroglycerin is the preferred power source in the game’s world. Said explosions aren’t just for show or convenience, either – they help you build up more and more impressive combos during the game’s many combat portions, at the end of which you receive a rating (and a bonus to skill-unlocking karma) based on your performance. Ultimately, Shadow Warrior delivers on exactly what it set out to do: it provides a reboot to a fun but long-gone title, and in the process presents a game that’s tremendously fun even for people totally unfamiliar with the original it’s based on. It’s hours of mindless, bloody, expletive-filled fun in an action-packed fantasy world illustrated with gorgeous graphics, a good variety of unlocks, and enough challenges to make completionists feel as if they got their money’s worth. You can pick this one up on Steam as of today, and if the prospect of a demon-fueled asian-themed adrenaline rush sounds like a recipe for fun to you, then set aside a few gigs of hard drive space and get ready to get your sword-and-gun-fu on.